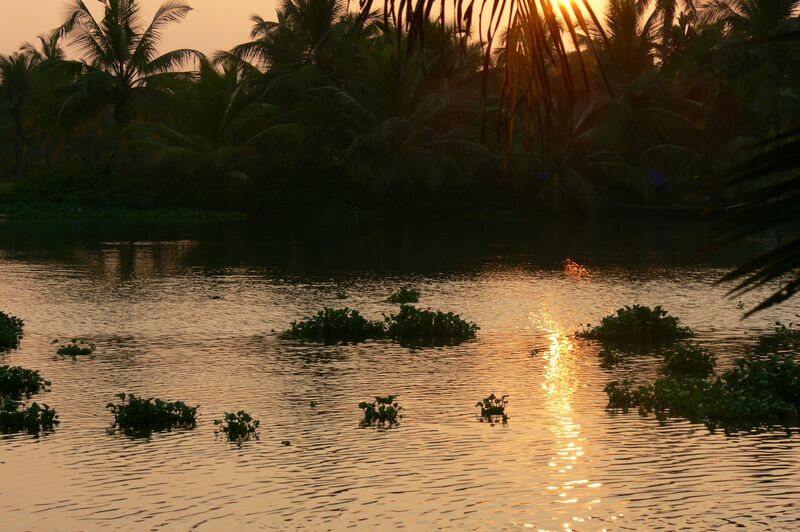 After our experiences in Alleppey and Kollam, I had given up slightly on finding peace and relaxation in Kerala again. When finally we found a place to lay our heads after our less than enjoyable day of canoeing around the backwaters, we were exhausted and even a cold beer did little to assuage that. But as a new day dawned, I confess a bit of excitement was creeping in – we were off to one of the top resorts in the region for a hotel review I was doing and had two more to experience after it for pieces which will appear soon on The Arbuturian. Now, I know it sounds terrible – after all, we were there to experience ‘proper’ India, not ‘posh’ India – but the desire to drink a cold drink without fear of poisoning myself on dirty ice cubes and the hope of using a public loo that was clean had overtaken my best efforts to find beauty in the chaos. A welcoming arrival awaited us in our cottage. The boy and I left behind our backwater hotel (the quite nice but very buggy Palm Grove Lake Resort) in a tuk-tuk, to head thirty minutes north to the exclusive Marari Beach Resort. In retrospect, arriving at a gated hotel in a tuk-tuk is not the most logical of transport methods (we were asked four times by the guard if we were sure we were in the right place) but little could bring us down: paradise was close enough to taste. 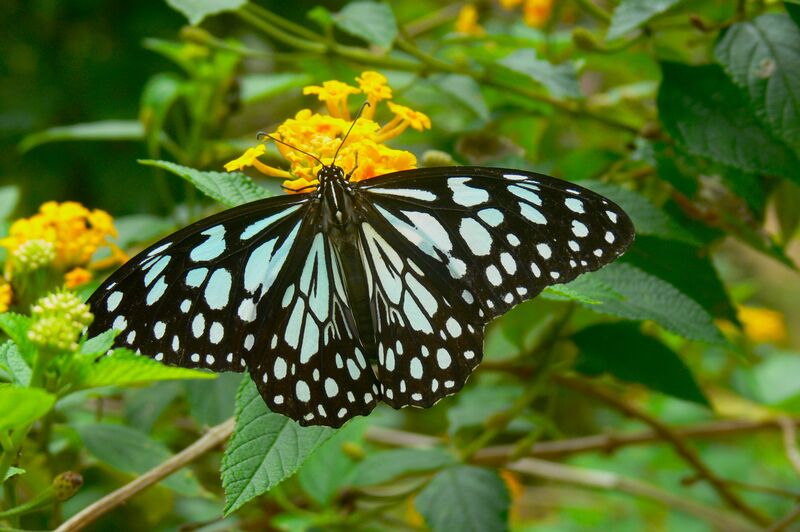 A stunning butterfly in the gardens. With access to a white-sand beach and a large outdoor pool, the eco-Marari Beach Resort is all about keeping in tune with the environment. An organic garden supplies much of the produce for the kitchens while an on-site bio-gas plant recycles kitchen waste into energy to run the electricity. 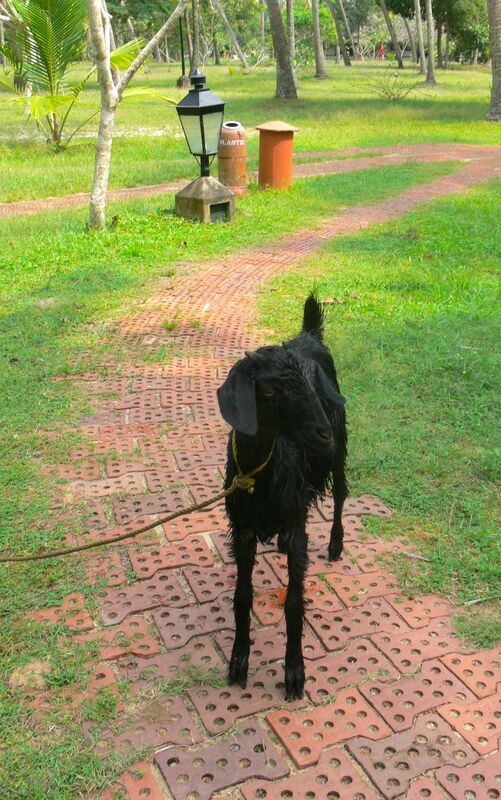 Goats and small cows roam the lawn to keep the land trim and a butterfly garden promotes conservation of rare species. Local school children are invited in to be taught about conservation as well. After checking into our thatched-roof cottage and washing off days of dirt in our beautiful outdoor shower, the boy and I headed to the crystalline swimming pool to finally relax into the swing of life that the more privileged class lead. 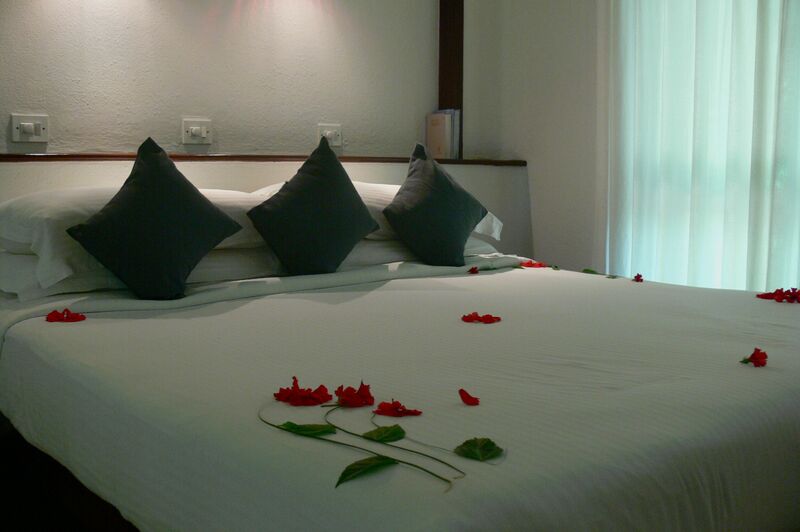 Relaxation, it seemed, is possible in Kerala – you just might have to pay for it. Finally we felt like were were on vacation. The next day, we departed the seaside to head to the nearby Kumarakom Lake Resort, which sits on the edge of the expansive Vembanad Lake. 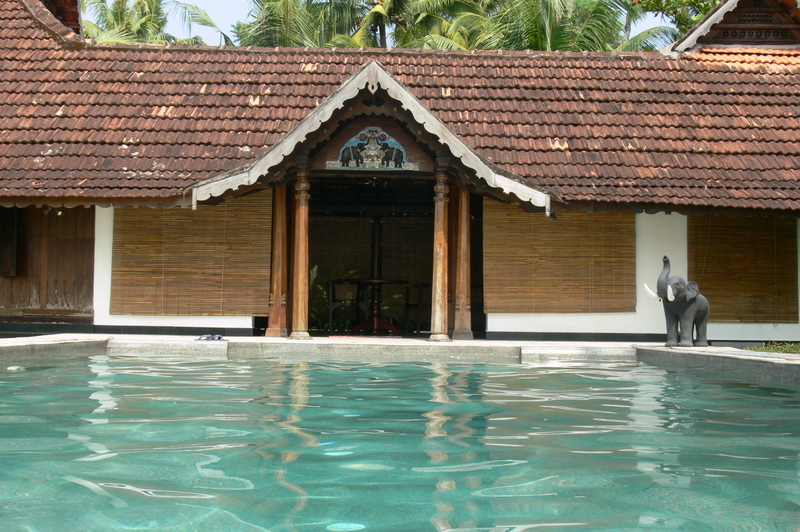 Voted the top hotel in India in the World Travel Awards last year, the Kumarakom took luxury to a new level. Feeling slightly like trespassers with our big backpacks, the boy and I were awed as we accepted flower wreathed coconuts and leis on arrival, and saw the expansive green grounds and shimmering lake. After a day laying by our private pool, we took a boat trip around the lake to watch the sunset (something offered daily to guests) and shared a bottle of wine over a wonderful seafood dinner. It was – it seemed – becoming a lifestyle that the boy and I could adjust to. After what felt like far too short a time span, we were off once again to head further north to the final review hotel – Vaamika Island Resort. I’d not heard much about this hotel beforehand so neither of us was sure what to expect. Unfortunately, we came into contact with a taxi strike, meaning the trip was doubled in length (and meant we had to go via Alleppey again) as our driver went all the way around the south side of the lake to avoid running into any of his colleagues who he knew would block his way since he was not on the picket line. A tense, long and hot cab ride ensued but it was all worth it when we arrived at a dock to find a leather-lined Sun-Ray speedboat waiting to pick us up. 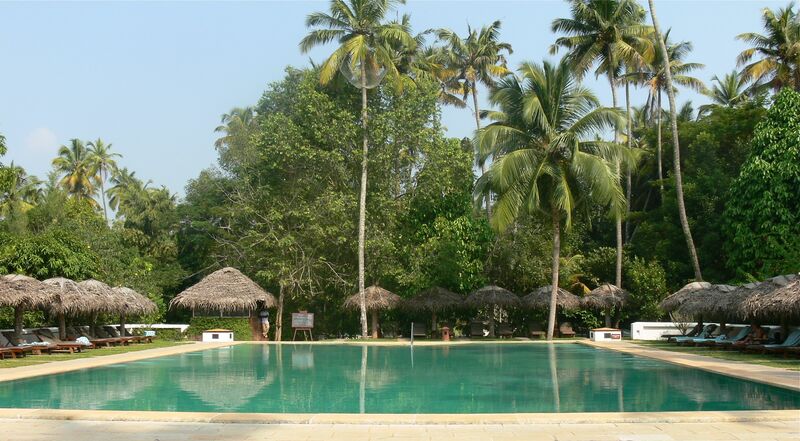 Vaamika Island Resort is situated on a private island in the backwaters near Kochi and was built by a slightly eccentric German named Klaus Schleusener who spent much of his working life teaching at universities in India. He sold the island to developers in 2011 and the company was in the midst of building more cottages during our stay. Upon stepping off the speed boat, we were led to the largest villa I have ever seen – complete with private pool looking out to the lake, large patio and incredible carved wooden features. After dropping off our bags, we were handed a mobile phone. Confused, I asked what it was for. “That is for your private butler Nibin who will be looking after all of your needs.” To say it was all surreal is an underestimation. The view from the pool at Vaamika. Our next two days were spent lounging by the pool, ringing Nibin for beers and eating copious amounts of food (at least 10 dishes every meal) on our patio. It was a world unknown to the boy and I, and we were slightly perplexed by the idea that people can choose to live like this as a normal choice on vacation. Ash pots in the museum on Vaamika Island. Interestingly, the island also features a private museum, which includes a collection of Kaavada (pronounced: cowardi) – stone or wood carved rectangular blocks that are worn on the shoulders of people taking pilgrimage (most often) to the Palani temple in Tamil Nadu. Pilgrims dance with these on their shoulders while making prayers to Hindu god Lord Subramanya. 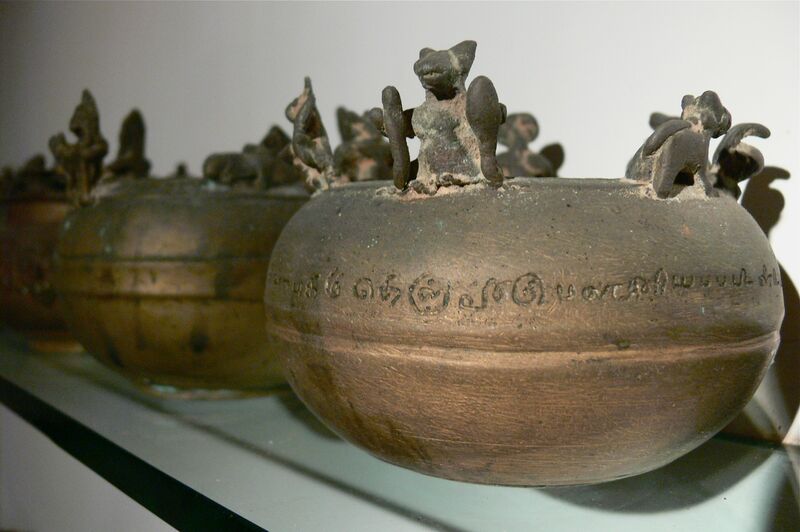 The collection also includes ash pots used for burying relatives’ remains, with some being 500 years old. Former-owner Klaus collected them all over the years, although he has never made a fuss about it and few art collectors/art historians even know it exists. We finally had to depart the island for our final night in Kochi before our flight home to London. But it was with lead-heavy legs that we dragged ourselves away from it, knowing we’d be unlikely to experience these levels of luxury anytime soon. And so, after four days of rest, the sheen of Kerala had returned. 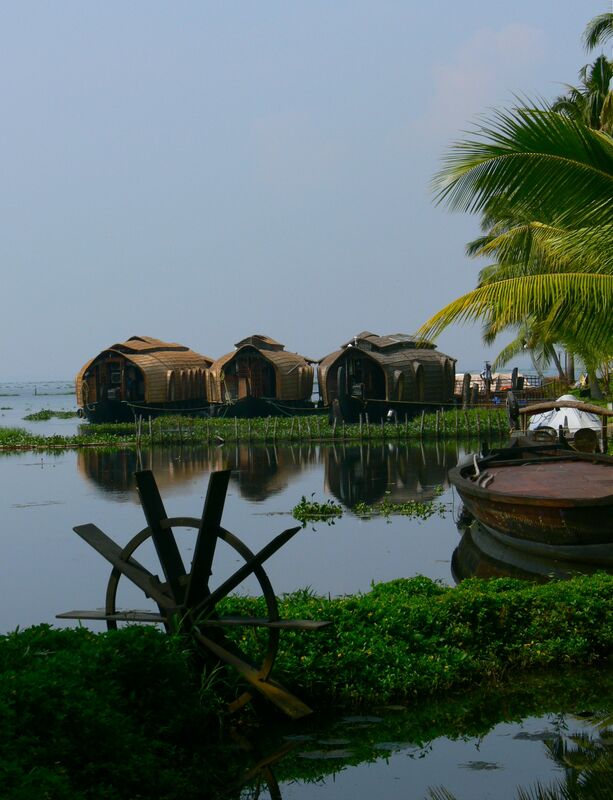 And while the relaxation was needed at the time, it is true the boy and I now talk about the hilariously unenjoyable times experienced in Alleppey and Kollam as much as the stunning beauty of these hotels. A bit of both, I suppose, can’t hurt during one’s travels. In the final part, the boy and I wander the dusty streets of Kochi, take in a bizarre Kathakali performance and say goodbye to India.